Introduction: Several authors have reported laparoscopic procedures conducted through an umbilical incision, with the intention of further reducing trauma, hospitalization and recovery time compared to conventional laparoscopy. At least two access ports for such surgery are now available commercially, but developmental questions regarding the optimal design for this approach remain unanswered. 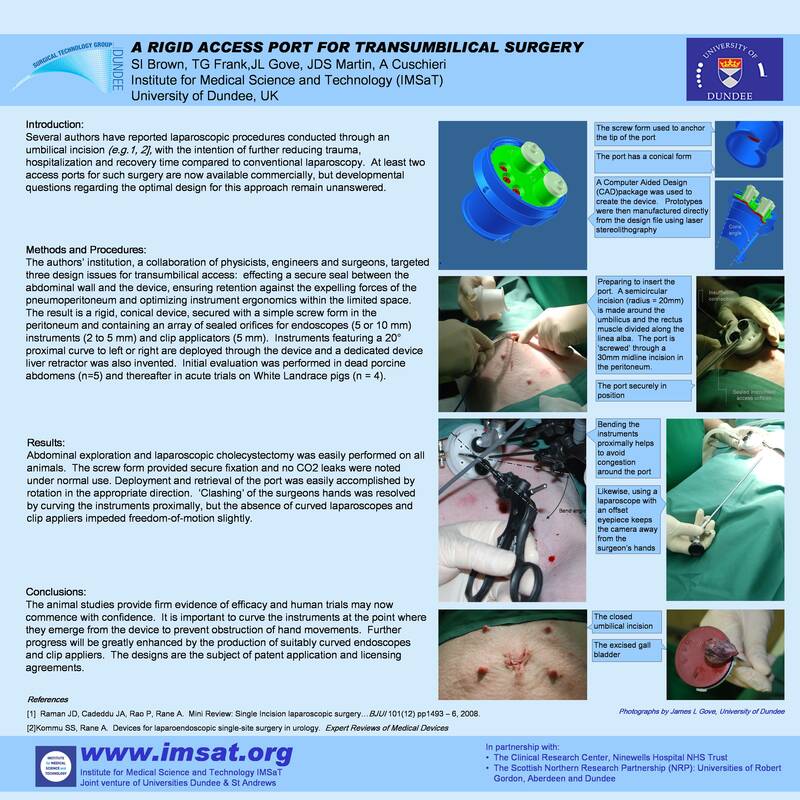 Methods and Procedures: The authors’ institution, a collaboration of physicists, engineers and surgeons, targeted three design issues for transumbilical access: effecting a secure seal between the abdominal wall and the device, ensuring retention against the expelling forces of the pneumoperitoneum and optimizing instrument ergonomics within the limited space. The result is a rigid, conical device, secured with a simple screw form in the peritoneum and containing an array of sealed orifices for endoscopes (5 or 10 mm) instruments (2 to 5 mm) and clip applicators (5 mm). Instruments featuring a 20° proximal curve to left or right are deployed through the device and a dedicated device liver retractor was also invented. Initial evaluation was performed in dead porcine abdomens (n=5) and thereafter in acute trials on White Landrace pigs (n = 4). Results: Abdominal exploration and laparoscopic cholecystectomy was easily performed on all animals. The screw form provided secure fixation and no CO2 leaks were noted under normal use. Deployment and retrieval of the port was easily accomplished by rotation in the appropriate direction. ‘Clashing’ of the surgeons hands was resolved by curving the instruments proximally, but the absence of curved laparoscopes and clip appliers impeded freedom-of-motion slightly. Conclusions: The animal studies provide firm evidence of efficacy and human trials may now commence with confidence. It is important to curve the instruments at the point where they emerge from the device to prevent obstruction of hand movements. Further progress will be greatly enhanced by the production of suitably curved endoscopes and clip appliers. The designs are the subject of patent application and licensing agreements.